We were delighted to work in partnership with the National Theatre of Scotland to support an artist in residence in Bun-sgoil Taobh na Pàirce (Gaelic medium nursery and primary school in Leith, Edinburgh) from October 2016 - January 2017. 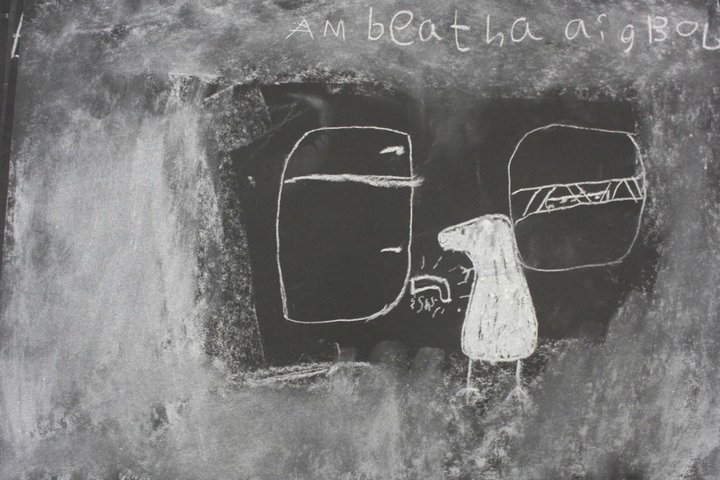 Iain Craig worked with the Primary 5 class leading to a sharing at the Biscuit Factory for pupils, teachers and families. Through this project, Iain explored traditional stories of Gaelic folklore and discovered what resonances they have for Gaels today. Drawing from his own childhood, he investigated the meaning of bedtime stories with the young people to see what new ones they might inspire. Together they explored how stories can be told visually, through design, animation and projection, and through sound, description and performance. They spent time to better understand this oral tradition, and the place of traditional Gaelic spoken word storytelling in today’s globalised and digitised world. Over the course of the project, Iain brought in a wide range of stimulus for the class using a number of different techniques and media. He also shared his knowledge of various artistic techniques to encourage young people to develop new skills alongside the story ideas they are exploring and creating.